Boston Bruins leading scorer continued playing Saturday after big collision. SportsPulse: The NHL trade deadline finished with a flurry of deals, but none bigger than Ryan McDonagh heading to Tampa Bay. See who were the big winners of deadline day. 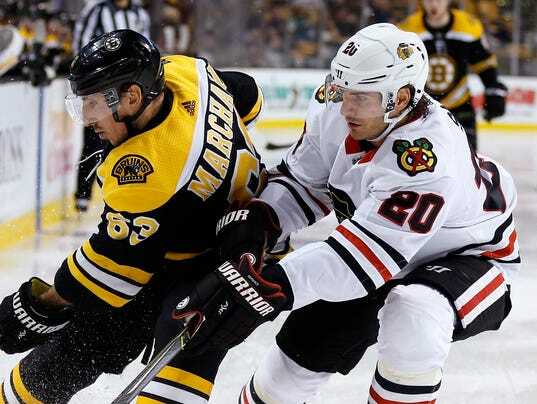 CHICAGO (AP) — Boston Bruins leading scorer Brad Marchand sat out Sunday’s game against the Chicago Blackhawks with an upper-body injury. Marchand, who has a team-high 29 goals and 69 points, collided with Blackhawks forward Anthony Duclair in the first period of Saturday’s game between the teams in Boston. More:Which NHL coach will be the first to be fired?